For many types of retailers, Halloween is just another day. It’s not a federal holiday, and because it lacks a gift-giving tradition like Christmas or Valentine’s Day, consumer spending tends to be moderate. Consider that the National Retail Federation found that the average American spends roughly 80 dollars on Halloween each year. While that might initially sound like a lot of money—and the statistic has been on the rise—it aligns Halloween purchasing habits with those of mid-level festive events such as graduations and Super Bowl parties. (For comparison, consider that the average American spends close to $1,000 on the winter holidays like Christmas, Hanukkah, etc.). Yet, climbing gyms tell a different story. Over the past several years, many gyms have realized that Halloween’s modest status can actually be quite beneficial: Halloween is a day staked in group celebration, and its traditional elements (candy, costumes, games) are nebulous enough that they can be effectively harnessed within a gym setting. Breuner is aiming for 500 attendees at Bend Rock Gym’s Halloween party this year; such a significant turnout would delight practically any gym. But beyond numbers, Breuner likes to think of Bend Rock Gym’s annual Halloween party as a glorified Member Appreciation Night. 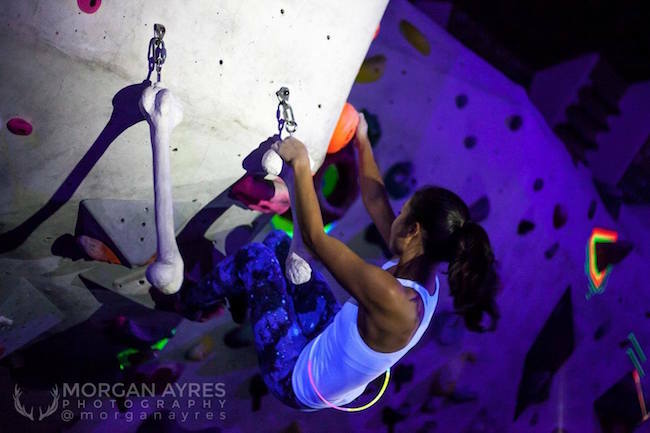 Patrons can have fun playing games and climbing while also taking part in free gear raffles, socializing with staff, or just enjoying free food. “Our goal is to give members an awesome experience, and in return, we’re confident that the fun and positive vibes they receive will ultimately help us keep them as returning members for years to come,” he says. Photos of costumes like these at Grand River Rocks get a lot of mileage on social media, which is reason enough for any gym to capitalize on Halloween. Halloween’s current rise in stock at many gyms is likely due to its optimal date on the calendar. By late October, summer has faded in the figurative rear-view mirror, meaning that families are around—as opposed to being away on vacation or busy with other holiday commitments. And children, ensconced in the milieu of school by that point, are usually craving a bit of a mental break. 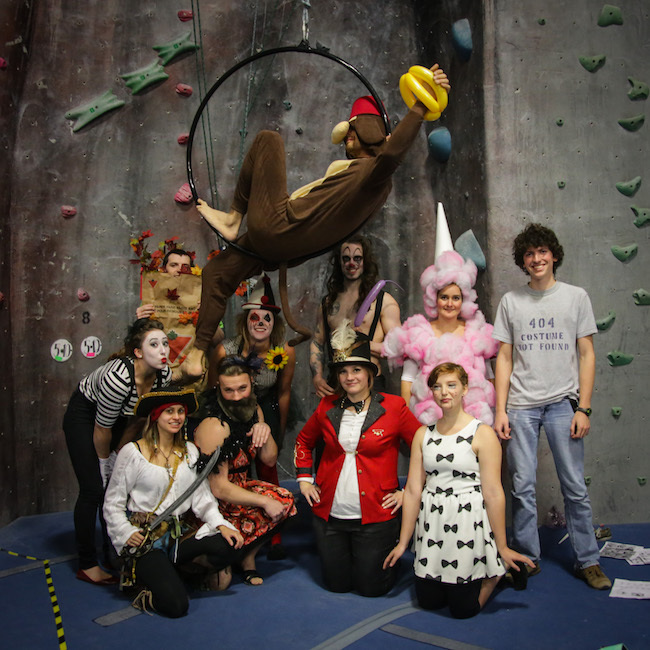 While many gyms like Breuner’s opt for a light-hearted celebration, others—like The Stronghold Climbing Gym in Los Angeles—employ Halloween as a culmination opportunity, of sorts. Patrons are naturally excited on the day, so any nightly event thereon automatically feels bigger. For the past several years, The Stronghold has used Halloween and that inherent hype as the conclusion of its ongoing Community Crushers competition series. “October and Halloween make for a great time for a competition because in general this is the start of the competition season and better weather for climbing,” says The Stronghold’s head routesetter, Kyle McCoy, who created the competition series. “Climbers are training more during this time and are climbing outside or are preparing to climb outside,” he adds. Combining competition with fun festivities underscores how any Halloween party’s success at a gym has less to do with the traditional ghosts-and-ghouls aspects and more to do with varying levels of community engagement. For example, Grand River Rocks in Ontario, Canada, spends up to a month prior to Halloween planning a number of activities that will be fun for all age demographics—not just kids, not just climbing-related, and not all overtly Halloween-related. “We’ve done headlamp climbing, milk crate stacking, slackline, volleyball, pumpkin carving, we normally have a photo booth set up, and of course, candy bags,” says Cornelia Le Roux, Manager at Grand River Rocks. Le Roux notes that getting staff involved in the festivities is important too, and so having smaller stations—as opposed to a strict schedule with a house MC running a larger, evening-long show—allows employees to stay loose while members can come and go at their own pace. Face-painting, theatrical performances, costume contests, and puppet shows—as well as accoutrements like strobe lights and fog machines—have proven popular at various gyms too, but all require staff allocation as well. But what about gyms that are still in that “small event” stage and looking to increase Halloween attendance numbers? Are there any tips that can be imparted from managers who already have a handle on getting the most out of the day? Breuner points out that serious consideration should be given to the actual date of the party. Many other establishments—schools, Boys & Girls Clubs, local sports teams—also hold events for Halloween, and those can cut into patronage numbers. 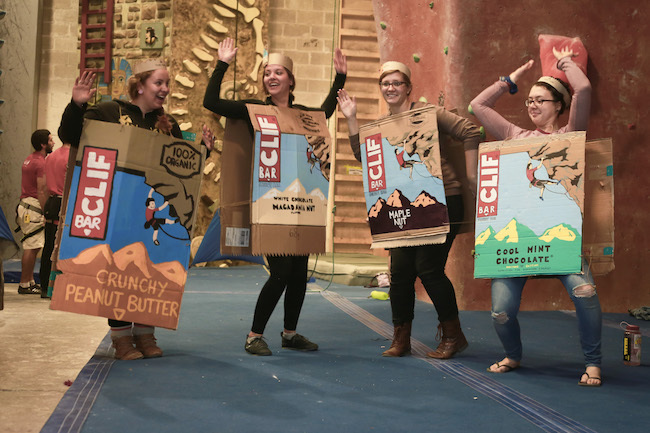 Such logistics are part of the reason why Breuner gives his staff at Bend Rock Gym a “10-week planning buffer” to prepare prior to the annual Halloween party. It’s worth pointing out that most gyms don’t even hold their respective Halloween parties on Halloween night, mainly to avoid forcing kids to choose between hitting the gym or going trick-or-treating. The examination of the Halloween practices at multiple gyms amounts to a conclusion that details matter; gyms should expect gains comparable to the amount of preparation and funding they put forth in the days and weeks leading up to any big party. Allow time for word to spread among members and anticipation to grow—not only in October, but also from year to year. At Top Out Climbing in Santa Clarita, California, meticulous planning means decorating everything from the restrooms to the lobby, “to convey the message that our facility is not only about climbing, but it’s about being social and making new friends as well,” says owner and General Manager Howard Konishi.